You can update your billing address by visiting sumo.com.au and selecting ‘update details’ in the top right of the page. Your account number and invoice number are located here. 4. How much do I owe? This shows the total amount to pay after any discount is applied as well as the total savings, so be sure to pay on time! Sumo offers a number of payment options including by telephone, online, direct debit and BPAY. 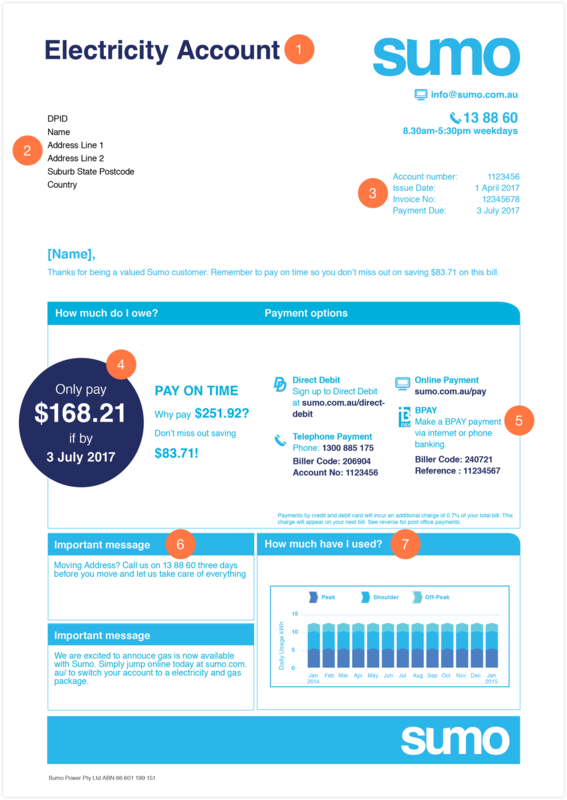 Details for payment at Australia Post are shown overleaf on the reverse of your bill. Sumo will provide you important messages to notify you of any changes to your account, including rate changes and other important reminders. Sumo also provides handy tips and special offers in this area. This graph shows your historic energy usage. This section summarises your account by outlining your previous balance, recent payments, new charges on the bill and any adjustments that have been made to your account since the previous bill. Note the total amount due shown here does not include your pay on time discount (if applicable). Here you will find your supply address, NMI (National Meter Index for electricity) or MIRN (Meter Installation Reference Number for gas) and details of meter readings during the billing period. The billing period is the time between the start and end meter read. Your NMI/MIRN is important because it is unique to your supply address and helps us ensure we are supplying the right property. Your usage and supply charges, as well as any additional fees, discounts and concessions are itemised here, so you know exactly what your rates are and how your bill is calculated. You can see if your usage charges are based on actual (A) or estimated (E) meter reads. The highlighted amount is your new charges with your included Pay on Time discount. Any adjustments or credits that have been applied to your account since your last bill will be listed here. Important contact details are listed here to ensure you get through to the right people such as your distributor, Sumo or an interpreter. Your distributor is important as they are the ones who connect the electricity/gas to your home. A good way to look at it is they own the lines and pipes to your home. How to find out more about Government concessions, rebates or other payment support. Compare your usage to other households and see what your energy is costing you each day. If you wish to pay your bill via Australia Post, simply tear off the payment slip or take the entire bill in so the barcode can be scanned and your payment made. The slip will display the total balance as well as the balance with any discounts if you pay on time. Note that payments via Australia Post can take up to two business days to be received so you should make the payment ahead of your due date. 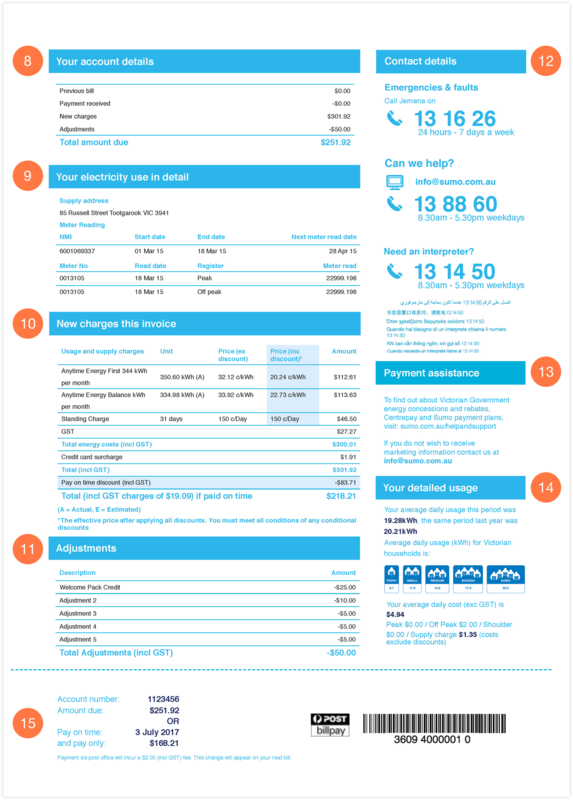 Use our comparison feature to compare you current electricity bill and find out how much you can be saving with Sumo.